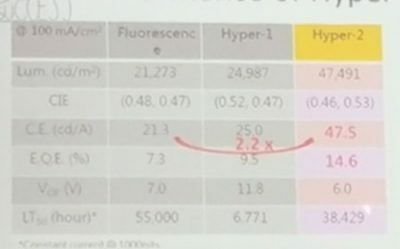 Is Hyperfluorescence ready for AMOLED adoption? Two weeks ago we announced a collaboration with WiseChip Semiconductor to use Hyperfluorescence emitters in WiseChip’s PMOLED displays. 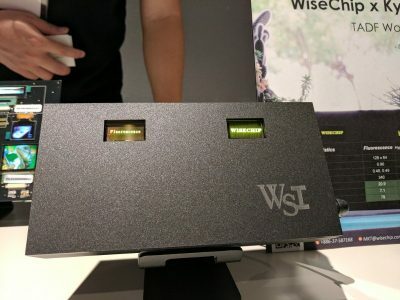 In early July, Wisechip demonstrated a working yellow monochrome prototype – with commercial production expected by the end of 2017 for both yellow and green displays. Hyperfluorescence emitters enabled WiseChip to boost the efficiency by around 50% while still maintaining the color purity and a lifetime of over 30,000 hours (LT50). Following this announcement, questions were raised as to the relevance of this technology for use in AMOLED displays, which represents a much larger market ($20 billion in 2017 and continue to grow fast compared to PMOLEDs’ $0.5 – 1 billion). Even though one should not rush to discount the PMOLEDs market, which is expected to stay relevant and grow (with the rise of wearables and introduction of flexible and transparent displays), it is clear that the AMOLED segment of the market remains dominant. In this article, we set out to clarify the difference between the two technologies and lift any doubt regarding the readiness of HF technology for AMOLED displays.